To be baptized is something very special. The first time your name was mentioned in God’s house was at the baptismal font. Baptism shows that the Lord was willing to attach His Name to yours. Do you realize what a great privilege this is? Would you be able to explain its meaning if called upon at school or work? 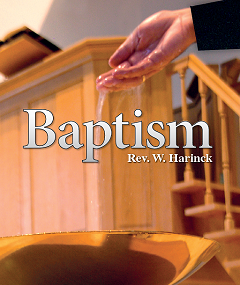 This book has been written in order to help you to better understand the significance of baptism. The essential point that remains is the necessity of knowing the God of your baptism personally, with your heart. Already when you were still very young He said to you, "Seek Me and live." Because you have been baptized, in a special way you may know that seeking the Lord will not be for naught. The Lord would not have done anything wrong if He would have never let His voice to be heard again. Yet it has pleased the Lord to speak to you already when you were still young. Hearken to the voice of the Lord!